A great way for the kids to eat their vegetables! I used cauliflower. This recipe was taken from The New Food Processor Bible by Norene Gilletz. 1. STEEL BLADE: Drop garlic through feed tube while machine is running; process until minced. Add onions and process with 3 or 4 quick on/offs, until coarsely chopped. 2. Heat oil in a large pot on medium-high heat. Add garlic and onions and sauté for 5 minutes, until golden. Add carrots, potatoes and cauliflower or broccoli to pot. Add broth; it should barely cover the vegetables. Season with salt and pepper. 3. Bring to a boil, reduce heat, cover partially and simmer 25 to 30 minutes, stirring occasionally. 4. Remove solids with a slotted spoon and process in batches on the STEEL BLADE together with parsley, dill and basil. I make this as a side dish to almost anything. This recipe is taken from The Best of Bridge series – The Rest of the Best and more. I use 3 large tomatoes or 4 medium sized tomatoes. This recipe is taken from “MealLeaniYumm!” by Norene Gilletz. 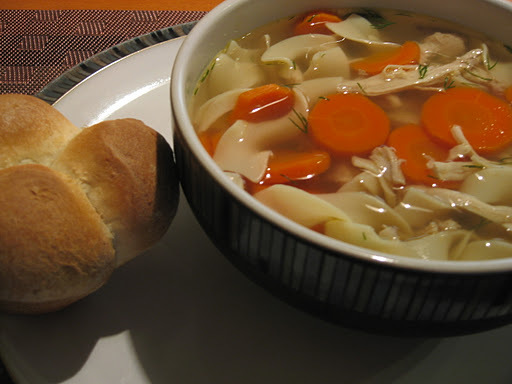 The only chicken soup I make. 1. Trim excess fat from chicken. 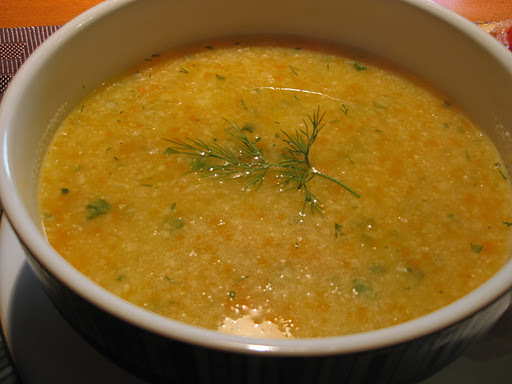 Place chicken in a narrow, deep soup pot. Add water. (it should cover the chicken completely). Add salt and pepper. Bring to a boil. Remove scum completely. Add carrots, celery, and onions. Cover partially and simmer gently for 1 to 1 1/2 hours. Add garlic and dill. Simmer soup 10 to 15 minutes longer. Adjust seasonings to taste. 2. Cool completely. Strain soup. Discard all veggies except the carrots. Refrigerate soup overnight. Discard hardened fat from surface of soup. 3. After the stock is made, I add in 1 cup of egg noodles. I cut up the carrots that I saved from the stock as well as the chicken meat. I add more salt and pepper to taste and add fresh dill. I treated myself to this wonderful sandwich today at lunch. This recipe was taken from Food and Drink magazine (compliments of the LCBO) Autumn 2007. 1. Place mayo, lemon juice, red onion, and capers in a bowl. Stir. Using a fork, mix in salmon. 2. In a separate bowl, stir dill into cream cheese. Slice buns in half horizontally. Spread bottom half of each with cream cheese. 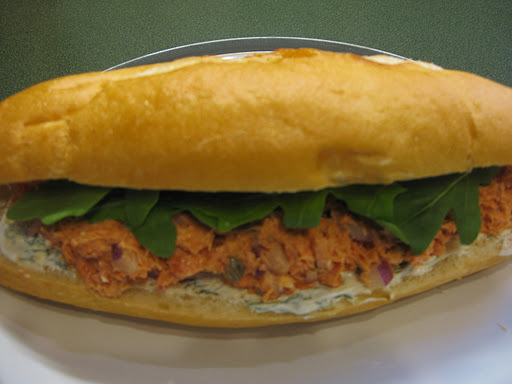 Top with salmon mixture then Arugula. Top with other half of buns to make sandwiches. A delicious, refreshing, very easy salad, made without oil. 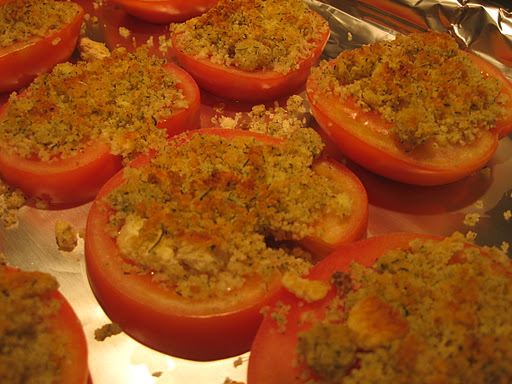 This recipe was taken from The New Moosewood Cookbook by Mollie Katzen. I used a 1% yogurt but next time I make this I would use the full fat yogurt, as it got quite watery. I also did not top with walnuts. 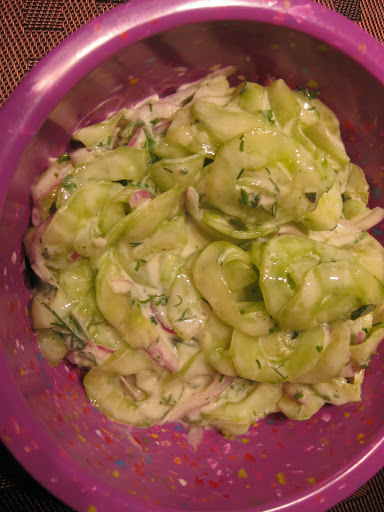 A mandolin makes quick work of slicing the cucumber. 1. Soak onion in cold water for about 30 minutes while you get everything else ready. Drain thoroughly and pat dry before adding to the salad. 2. Peel (unless they’re homegrown or unwaxed, in which case, don’t) the cucumbers, seed them, and cut them into thin rounds. Place them in a medium sized bowl. 3. Add remaining ingredients except walnuts, and mix well. Cover and refrigerate until serving time. 4. Sprinkle the walnuts on top just before serving.